Cut a toilet tissue roll in half. Select the wrapping paper designs and colors of your choice. For the top covering of the drum I used the back side of my wrapping paper – using the tissue tube as a guide cut a circle shape from the wrapping paper about 1/4 of an inch larger than tissue tube. Place the circle shape on table with the design/color side up. Center one of the open ends of tissue tube in the middle of the circle and rub glue stick around the edges of the circle. Carefully lift, stick and smooth circle edges around tube. Measure and cut a piece of wrapping paper about a half an inch longer than the tissue tube bottom end. Wrap paper around the tube and secure with tape or glue stick. Push the edges of the paper down into the tube covering the edges of the tissue tube bottom. 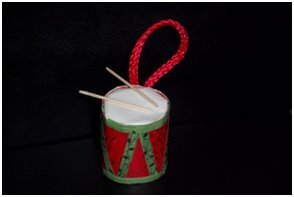 Cut some thin strips of wrapping paper and glue onto sides of drum going from top to bottom and ending with a piece glued around the top and bottom of the drum. Snip off the ends of 2 toothpicks and rub with glue stick and stick on top of drum. Make a loop with yarn, twine, ribbon or whatever you want to use to hang your ornament, and tape on the top back side of your drum.